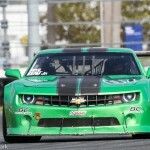 Great racing, beautiful weather and incredible performance by the BC RaceCars crew marked the last SCCA Trans-Am race at Daytona International. BC RaceCars had three cars running, two TA machines driven by Andrew Romocki and Allan Lewis and our TA2 car driven by Steve Kent Jr. from Maryland, USA. Allan had a unfortunate accident during the first practice session on Wednesday, severely damaging the car. The crew spent the next few days feverishly repairing it by fitting new body panels to the car, welding and repairing all the damaged sections. It wasn‘t pretty, but we finally had the car back together for Thursday’s second practice session, and at last Allan had the chance the shake the car down a bit before qualifying. With all the practice time missed, we were severely behind in set-up and the results showed; Allan started the race close to the back but reliability and perseverance resulted in a 5th place finish, the best for him this year! Congrats to him and the entire crew for not only making the race but finishing! Andrew had an incredibly colorful weekend as well. It started with a major blow up of a transmission, which was easily remedied. Not so easy was an engine loosing power, which was not diagnosed till the last practice session on Thursday, requiring the crew to stay late for an engine change. We barely made qualifying the next day, and Andrew pushed very hard to try to get a decent qualifying result, unfortunately spinning and flat spotting all four tires. As per TA rules, new tires required us to start from the back of the field. Andrew made up good places, fighting hard for each spot, getting up all the way to the top 7 before a differential failure ended his race. Again, a good showing of speed and great work from the crew! 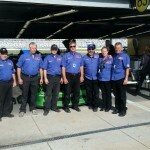 Steve has never driven our green TA2 car, but got comfortable almost from the first practice session. He had us change the set-up slightly as the car was too loose for his liking, as well as adjust the brake bias, and get more “drive off the corners“. All adjustments were carried out quickly, and by the second official practice session, Steve piloted the car to the top of the charts! He continued with a 5th place qualifying effort (which was cut short to only 2 flying laps by a red flag and a Cope car holding him up badly) but truly showed his pace during the race. He patiently battled his way up to 3rd, even though the car lacked the straight-away speed of his competitors, making it all up with driving and the set-up. 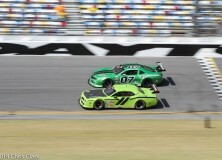 Unfortunately, a stuck transmission forced an un-scheduled pit stop, but still resulted in an 8th place finish. We are definitely looking forward to working with Steve again, we were truly impressed by his talents. 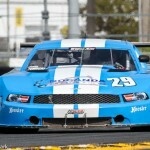 We would like to thank Trans-Am on another great event and for all their efforts this year. They have elevated this series to a level that inspires pride of participation, with pro drivers and teams to race against, good fields and great venues. We encourage everyone in racing to consider joining. Also a special thanks to the BC RaceCars crew, for all their hard work, dedication, and commitment, not just this event but for the entire year. They are simply as good as any crew out there; John Maloney, Martin Lee, Scott Zurrer, Andrew Zitman, Frank Neilson, John Bissette, Chris Johnson, Chris Albin. Thanks! 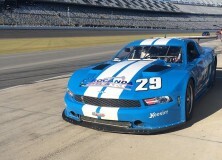 Andrew Romocki (and family) and BC Racing spent a glorious weekend at Daytona International Raceway with the TA GT-1 Mustang entered in two classes of competition at a NASA sanctioned event. Both Mike and Andrew easily won their respective classes, and we are looking forward to some serious competition in a few weeks time at the season finale of the SCCA Trans-Am Series.